Why is Zephyr Travel Pillow Unique? ✈ Patented High Neck Support – The secret to Zephyr airplane pillow is in the science of sleep. 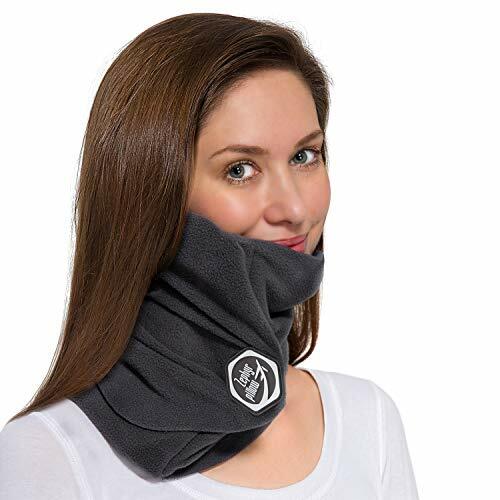 It has strengthened ribs in the cushion to provide scientifically proven head and neck support. This internal support system hidden in this orthopedic pillow is patented design. The brace in the pillow has some flex room to withstand the wear and tear of travel. ✈ Unisex Fit, Travel Pillow for Men and Women – Zephyr pillow’s unique design makes it usable by men or women, people with narrow or wide, long of short necks. The scarf cushion design provides enough space for you to use with big headphones as well – handy for using sound-cancelling headphones on a long-haul flight. ✈ Why Fleece? – The super soft micro fleece is machine washable and very durable. As frequent fliers know it can get quite cold on a plane, so Zephyr plane travel pillow is designed to create a feeling of being snug and secure, we use lighter fleece that is breathable, lightweight, and doesn’t compromise on warmth and comfort. ✈ Fit for Naps Everywhere – Keep your mouth from hanging open when you fall asleep on flights, in cars or trains! Fight jet lag and road trip fatigue with this travel rest pillow that will let you snooze on the go – the Zephyr pillow’s got your…neck. ✈ Very Small and Light – Zephyr neck pillow weighs less than half a pound so that you don’t have to worry about adding to your luggage load, perfect for short and long-haul flights. It folds up for easy packing with compact dimensions: 7.08 inches x 3.5 inches x 7.08 inches. Limited product launch price - Add Zephyr travel neck pillow to the cart today! ✈ PERFECT LONG-HAUL FLIGHT TRAVEL PILLOW - Zephyr travel pillow is ergonomically designed to help prevent long-haul flight neck pain and soreness, it provides firm but comfortable neck support from the side to prevent the neck pain that comes from tilting your head too much to the left or right. ✈ SMALL AND PORTABLE AIRPLANE NECK PILLOW - The Zephyr pillow is purposely designed as scarf neck support for several reasons; to be as small and portable as possible, weighs only 5.2oz (148g), to provide full neck and head support, to keep your neck warm and cozy on heavily air-conditioned flights and to fit well with your comfortable and stylish travel outfits. ✈ UNIQUE ERGONOMIC DESIGN FOR SIDE SLEEPERS- A high neck pillow provides optimal support for those spending long time in upright positions, such as in an office chair or airplane seat. A traditional U-shaped airline pillows provide support on all sides, but this neck pillow is specifically ergonomically designed for side sleepers. ✈ TROUBLE FREE EASY CARE - Zephyr neck support travel pillow fleece material is 100% machine washable, just remove plastic frame before. It also comes with its own fleece travel bag to protect it from getting dirty during plane transfers. ✈ SCIENTIFICALLY DESIGNED ORTHOPEDIC DESIGN - Zephyr travel cushion is based on the science of sleep. The secret to the high neck support is in the internal plastic frame hidden in the super soft fleece lining. The frame provides head and neck support it needs so that you can comfortably side sleep while travelling. If you have any questions about this product by Zephyr Pillow, contact us by completing and submitting the form below. If you are looking for a specif part number, please include it with your message.